As a toner manufacturer under the UK WEEE Regulations, UTAX (UK) Ltd complies with its Producer Obligations and operate a ‘take back and recycle’ scheme for used toner cartridges, containing an electronic chip and placed on the market by UTAX (UK) LTD after 13th Aug 2005. Used toner cartridges will be disposed of responsibly, without going into landfill, and as many components as possible recycled into re-useable materials. To request disposal of genuine UTAX used toner cartridges (purchased in the UK after 13th August 2005) click here. Please note – only those toner containers that include an electronic chip device or display the “crossed out wheelie bin” symbol are eligible to be recycled under our WEEE scheme. For a list of toner container models that do not contain an electronic chip, click here. 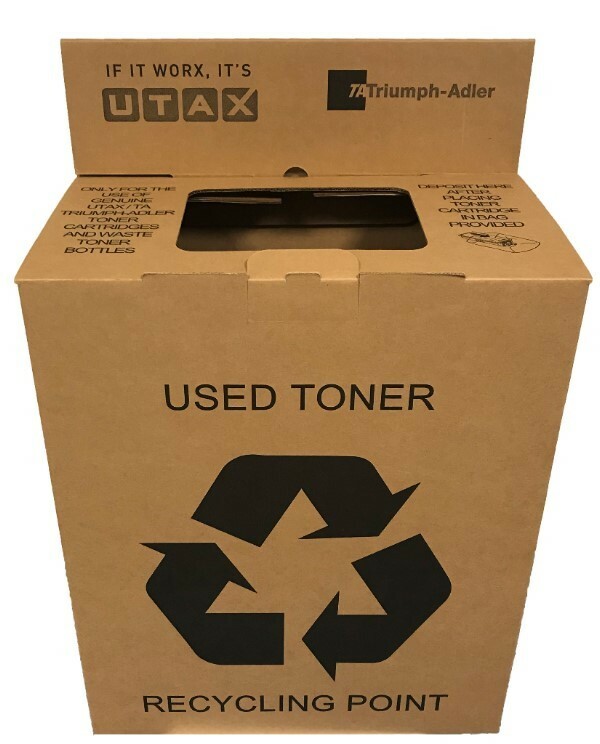 If you are a UTAX Partner you can now purchase a 'Used Toner Recycling Box' - offering you and your customers an easy and efficient way in which to recycle your old UTAX used toner cartridges and waste toner tanks.